On CBS's Sunday Morning, correspondent Rita Braver conducted a fawning interview with Nancy Pelosi, portraying the widely unpopular Speaker of the House as a strong leader taking on her opponents: "Nancy Pelosi is considered one of the most effective speakers in congressional history....Believe it or not, Republicans are out to fire Pelosi and Madam Speaker is firing back." Braver began the segment by declaring: "Speaker Nancy Pelosi is all business. Whether it's on her morning walk along the Potomac....Or showing off the private balcony outside her Capitol office." She then lobbed this softball to the "all business" Speaker: "Do you ever let yourself relax and just do nothing? Loaf a little?" Pelosi replied: "I think I may take that up, but not until after the election." Braver lamented how Pelosi's supposed effectiveness has made her a target for the GOP: "As the irresistible force who marshaled House Democrats to pass controversial administration policies – including the stimulus package, Wall Street reform, and health care – she's become a punching bag for Republicans." She added: "There's even a nationwide 'Fire Pelosi' bus tour." When Braver asked Pelosi about the RNC campaign bus, the San Francisco Congresswoman proclaimed: "Who cares? We've got to get a tow truck and tow it away just as we had to get a tow truck to pull the economy of our country out of the ditch that the Republicans drove us into." Braver argued that "Pelosi's support for a middle class tax cut, children's issues, and education, has made her a hero in some quarters." However, she did note how "a lot of people really don't like her. Seeing her as a free-spending San Francisco liberal....according to a recent CBS News poll, only 15% of Americans view her favorably. 44% unfavorably....even some Democrats are running ads trying to distance themselves from her." Despite all that bad news, Braver described Pelosi as "unshakable" and that the Speaker "didn't get where she is by being meek." The CBS reporter even mentioned Pelosi's decorating skills: "As the first woman Speaker of the House, she not only changed the political landscape but also the furniture in the Speaker's office." Pelosi remarked: "Before it was a very dark place. Looked like a men's club. I guess there was a reason for that." Braver turned to Pelosi's biography: "...she's well-schooled in the workings of the men's club that once dominated American politics. Her father, Thomas D'Alessandro, was a member of Congress and mayor of Baltimore. At age 7, she held the Bible at his swearing-in." Braver touted Pelosi's commitment to family: "...she didn't run for office until she was 47 and her five children were grown. Married to her college sweetheart, wealthy businessman Paul Pelosi, she concentrated on honing her mothering skills." At that point, Pelosi's daughter Christine spoke to Braver, claiming: "So there was always coalition-building to do around five kids. What do you want to eat? What movie do you want to see? What activity do you want to do?" Braver quipped: "Who knew that that was training for being speaker, huh?" She went on to add: "Nancy Pelosi says her most treasured job is not speaker but grandmother of eight....and says her political career is based on making life better for America's children." Braver touted Pelosi's political influence: "Here's a startling number. Since 2002, she's raised more than $217 million for Democrats....She's credited with bringing order and discipline to what can be an unruly Democratic side of the House." But she also explained how the Speaker "does seem to be a lightning rod, criticized for everything from her designer suits to her authorized use of government planes," quickly adding, "...she says it's her effectiveness that rankles her critics." Braver refrained from asking Pelosi any tough questions until the very end of the interview, challenging the Speaker on the unpopularity of ObamaCare: "...it's been six months since it's passed and people haven't started to like it any better." Pelosi claimed: "It's about even now. I think the polls today show it about even." Braver then concluded: "There is, however, a certain irony in the fact that the health care plan Pelosi considers her crowning achievement could be her party's undoing in November. But true to form, Nancy Pelosi is having none of it. Don't you worry that maybe you could end up instead of being one of the most famous speakers in history to be just a footnote?" Pelosi responded: "I'm not a footnote. I'm the first woman Speaker of the House, we've passed the most comprehensive health insurance reform. I didn't come here about me. I came here about policy and the issues." CHARLES OSGOOD: Campaign 2010 is in the stretch now, with just 16 days to go before election day. The job of the man in the White House is not on the line, of course, not directly anyway. But at the other end of Pennsylvania Avenue, the job of the woman of the House most definitely is, along with every other member of the House. Nancy Pelosi is a trail-blazing but controversial Speaker of the House. Whose future hold on that position hangs in the balance. Rita Braver will be reporting our cover story. RITA BRAVER: Nancy Pelosi is considered one of the most effective speakers in congressional history. But now she's faced with the fact that Democrats could lose the House in November. You get indignant when you hear that. PELOSI: I don't get indignant. I just don't believe it. BRAVER: Believe it or not, Republicans are out to fire Pelosi and Madam Speaker is firing back. Later on Sunday Morning. OSGOOD: Nancy Pelosi is by no means the only woman of the House, but she is the first woman Speaker of the House of Representatives, a leader for her supporters, but a lightning rod for her critics. Our cover story is reported now by Rita Braver. BRAVER: So you come out here and is this where you think about stuff? PELOSI: No, mostly I'm on the phone. BRAVER: Speaker Nancy Pelosi is all business. Whether it's on her morning walk along the Potomac. PELOSI: This is the Speaker's balcony, which has one of the most spectacular views of Washington D.C..
BRAVER: I'll say. Or showing off the private balcony outside her Capitol office. Do you ever let yourself relax and just do nothing? Loaf a little? PELOSI: It sounds like a good idea. I think I may take that up, but not until after the election. BRAVER: Pelosi has good reason to worry about this election. ANNOUNCER: Ladies and gentlemen, the Speaker of the House of Representatives, Nancy Pelosi. BRAVER: As the irresistible force who marshaled House Democrats to pass controversial administration policies – including the stimulus package, Wall Street reform, and health care – she's become a punching bag for Republicans. CAMPAIGN AD: California has Nancy Pelosi. We have Annie Custer. She supports Nancy Pelosi's big spending programs. CAMPAIGN AD: Debbie Halvorson. She listens to Nancy Pelosi instead of us. BRAVER: There's even a nationwide 'Fire Pelosi' bus tour. MICHAEL STEELE: Now how do you like my bus? BRAVER: Starring Republican Party Chairman Michael Steele. MICHAEL STEELE: Know that you have had a hand in firing Nancy Pelosi. BRAVER: The chair of the Republican National Committee is driving around the country in a 'Fire Pelosi' bus. How about that? PELOSI: Who cares? We've got to get a tow truck and tow it away just as we had to get a tow truck to pull the economy of our country out of the ditch that the Republicans drove us into. In the course of this year we will have created more jobs this year, 2010, than in the entire Bush administration of eight years. BRAVER: Pelosi's support for a middle class tax cut, children's issues, and education, has made her a hero in some quarters. PELOSI: Nothing has been more wholesome for the political process and for government than the increased participation of women. BRAVER: But a lot of people really don't like her. Seeing her as a free-spending San Francisco liberal. Start with those who showed up at the bus. UNIDENTIFIED MAN: Tax and spend liberal. UNIDENTIFIED WOMAN: She's evil. She's evil. UNIDENTIFIED MAN B: I think she's probably the worst American leader since Benedict Arnold. BRAVER: That's pretty harsh, but according to a recent CBS News poll, only 15% of Americans view her favorably. 44% unfavorably. And Pelosi is having trouble convincing voters that her party should stay in power. What's the message this time? PELOSI: Well, the message this time is we're fighting for the middle class. We're going forward, moving America forward. We're not going back. And this is hard because we were in a deep ditch and now we have to dig the country out. BRAVER: But even some Democrats are running ads trying to distance themselves from her. MIKE MCINTYRE: I don't work for Nancy Pelosi. CAMPAIGN AD: And voted against Nancy Pelosi's energy tax. UNIDENTIFIED MAN: I like that Jason Altmire is not afraid to stand up to the President. UNIDENTIFIED WOMAN: And Nancy Pelosi. BRAVER: Yet the speaker is unshakable. In the face of polls which, you know, are – seem to show that the Democrats have some very serious problems, pundits predicting that the Democrats will surely lose control of the House, you get indignant when you hear that. BRAVER: Pelosi didn't get where she is by being meek. As the first woman Speaker of the House, she not only changed the political landscape but also the furniture in the Speaker's office. PELOSI: Before it was a very dark place. Looked like a men's club. I guess there was a reason for that. BRAVER: But she's well-schooled in the workings of the men's club that once dominated American politics. Her father, Thomas D'Alessandro, was a member of Congress and mayor of Baltimore. At age 7, she held the Bible at his swearing-in. PELOSI: My mother and father had seven children. I was the youngest and the only girl. So there was that. BRAVER: At 16, her dad took her to meet then-Senator John F. Kennedy. PELOSI: I still have this dress just because sloth pays off. You know, I never threw some stuff away. BRAVER: In fact at age 70, Pelosi is a striking combination of both the new and old orders of American politics. She is the highest female elected official in U.S. history. Second in the line of presidential succession behind the Vice President. But though active in Democratic politics, she didn't run for office until she was 47 and her five children were grown. Married to her college sweetheart, wealthy businessman Paul Pelosi, she concentrated on honing her mothering skills. CHRISTINE PELOSI: So there was always coalition-building to do around five kids. What do you want to eat? What movie do you want to see? What activity do you want to do? BRAVER: According to her daughter Christine, it's all come in handy. BRAVER: So who knew – who knew that that was training for being speaker, huh? PELOSI: That's right. Multiple caucuses, multiple ideas and backgrounds and talents. 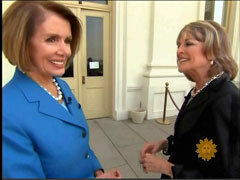 BRAVER: Nancy Pelosi says her most treasured job is not speaker but grandmother of eight. She proudly shows off two-year-old Isabella at a Washington event and says her political career is based on making life better for America's children. But the little ones keep her grounded too. ANNOUNCER: The gentle lady from California, the Speaker of the House, Mrs. Pelosi. BRAVER: Pelosi moved into the leadership after 14 years in Congress. But first she had to break through what she calls the marble ceiling. BRAVER: In the end, male members were won over by Pelosi's fund-raising and campaign skills. Here's a startling number. Since 2002, she's raised more than $217 million for Democrats. BRAVER: She's credited with bringing order and discipline to what can be an unruly Democratic side of the House. However, she does seem to be a lightning rod, criticized for everything from her designer suits to her authorized use of government planes. PELOSI: Those in favor say aye. BRAVER: But she says it's her effectiveness that rankles her critics. And even Michael Steele, a fellow Marylander, seems to agree. STEELE: Well, she's from Baltimore. So, you know, we know how to – we know about effective leadership in the state of Maryland, for sure. I just happen to disagree with the effectiveness of it. But no, she's been very effective at ramming through an agenda that the American people doesn't want. BRAVER: He's talking, of course, about health care. PELOSI: We took an idea that was very popular and if we shoved it down anybody's throat it was the insurance companies. BRAVER: But it's been six months since it's passed and people haven't started to like it any better. BRAVER: You think they'll like it more? PELOSI: Oh, once they know. BRAVER: There is, however, a certain irony in the fact that the health care plan Pelosi considers her crowning achievement could be her party's undoing in November. But true to form, Nancy Pelosi is having none of it. Don't you worry that maybe you could end up instead of being one of the most famous speakers in history to be just a footnote? PELOSI: I'm not a footnote. I'm the first woman Speaker of the House, we've passed the most comprehensive health insurance reform. I didn't come here about me. I came here about policy and the issues. And I wouldn't – are you saying would I rather not have passed the health care bill so I could keep this office? Never, never.